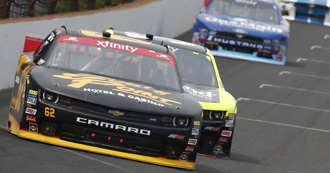 The Brendan Gaughan hero card for 2014 features Brendan along with the #62 South Point Hotel & Casino Chevrolet Camaro on the front, as well as the South Point Hotel & Casino located in Las Vegas, NV. On the back you will find Brendan’s bio, career highlights, and various facts about himself. These hero cards are 8×10 and printed on a very durable 10 point card stock for long life. The Brendan Gaughan hero card for 2017 features Brendan along with the #62 South Point Hotel & Casino Chevrolet Camaro on the front, as well as the South Point Hotel & Casino located in Las Vegas, NV. On the back you will find Brendan’s bio, career highlights, and various facts about himself. These hero cards are 8×10 and printed on a very durable 10 point card stock for long life. There is no charge for hero cards, to receive your own please fill out the form below.